More and more projector brands select TI DLP solution, because it is easy to produce and has strong support from TI. The size of DLP solution projectors is much more small. Why EPSON insist on 3LCD solution? 3LCD is brighter in color and good in reducibility. The LCD projector contains three separate LCD glass panels, which are three components of the video signal red, green and blue. Each LCD panel contains millions of liquid crystals, which can be configured to open, close or partially closed positions to allow light to pass through. Each individual liquid crystal is essentially like a shutter, representing a single pixel. When green, blue and tricolor pass through different LCD panels, liquid crystal depends on how much pixel needs to be opened and closed immediately. This behavior modulates light and produces images projected onto the screen. DLP in order to define colors, need a color wheel which contain red, green and blue filters. This color wheel rotates on the optical path between the lamp and the DLP chip, making the color projected onto the chip continuously changing between red, green and blue. Microlenses are based on how much each pixel needs for each pixel at a given time, reflecting the light in real time or entering the path of the lens. This behavior modulates light and produces images projected onto the screen. For more color brightness, besides tricolor, usually add an additional white or yellow color to the color wheel. From the projection theory, we know the point of screen of 3LCD always has tricolor, just the share is different. But DLP just ONE color, and change very frequently. Color wheels will produce rainbow effects in DLP, but 3LCD has not. The weakness of DLP technology, which is most often pointed out, is that it has the tendency to produce “rainbow effect”. The rainbow effect (sometimes referred to as color separation image error) is the flash of a striped color that looks like a rainbow. It happens at random, and it lasts only for a moment. But for people who are sensitive to rainbows, they are very distracting. If you put your heart into a movie or a TV show, the rainbow effect can completely destroy your appreciation experience. The rainbow effect is only a problem on single chip DLP products, and in most cases it appears only on products that use slower color wheels. This problem usually occurs when watching a movie or TV. People often do not feel the problem when watching pictures or pictures of still pictures, such as speeches. The reason why rainbow comes from is the continuous color renewal from color wheel. When the color wheel rotates, the image on the screen is red, green or blue at any given moment. The technology relies on your eyes to detect changes from one color to another. However, when your eyeball moves quickly in response to some movement in the picture, you get three updates in red, green, and blue on three different points on the retina, creating the impression of a rainbow. Not everyone will feel the rainbow in the same way. Many people’s eyes are not sensitive enough to be able to detect the rainbow. The rest of the people will be able to see the rainbow easily. In addition to watching a DLP projector yourself, there is no other way to know whether you belong to someone who can see or cannot see. Since LCD projectors always display red, green and blue images at the same time, they do not produce rainbow effects. The speed of color wheel is increased to a high level, such as more than 7200RPM, the rainbow effect will be less and weak. As told before, 3LCD can partially open to create gray colorful, but DLP can not. DLP microlenses should on/off very frequently to simulation gray effort. This method is called high frequency vibration. It works fairly well for the present grayscale, but it produces some visible instability in a continuous region, most in the dark area, which is called a high frequency vibration image error. It looks like digital noise, but it is an image error caused by the DLP technology itself, not the signal. High frequency vibration image errors do not occur on LCD products, because LCD does not use high frequency vibration to get different gray levels. The liquid crystal can be fully open, closed, or partially opened in the middle to get the required level of brightness transmissions – again, this concept is similar to the shutter’s loose leaf. No technology is perfect, 3LCD has some defect. There are three LCDs inside, so the size of 3LCD projector will be much bigger. And the light road is hardly to seal up, dust maybe fly into the system. As before, contrast ratio is a problem with 3LCD system, now it is not with technology improved. After all, 3LCD is better in the image brightness and resolution. 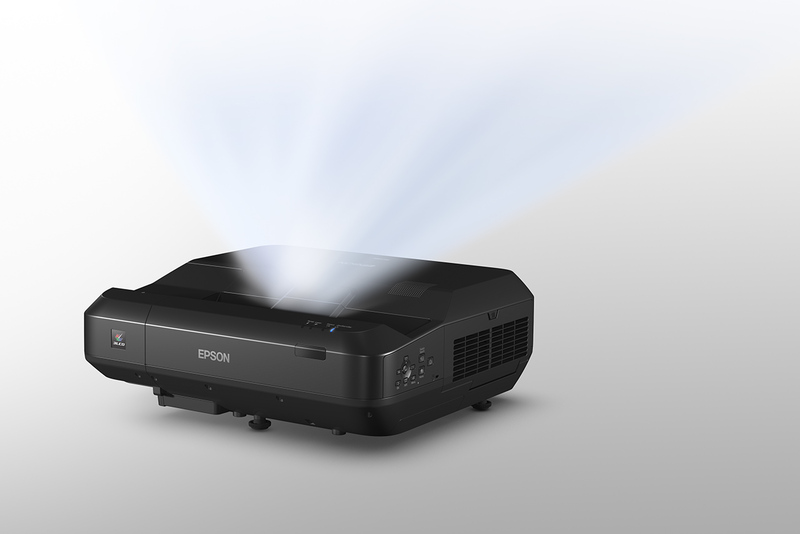 As launched September 2017, Epson LS100 gotten many fastidious sight from the experts as usually. Can it beat LG or BenQ Laser TV? AVS Forum thinks Epson LS100 is better, and gives it “Best of CEDIA 2017 “. Class 3R laser product, 37.5mW power output. Deep Black contrast ratio — features an extraordinary contrast ratio up to 2,500,000:1, for exceptionally deep blacks and brilliant, vivid colors. LS100 support correction of four angles and correction of surve, easy to put any place of front TV desk. The projection screen brands, I suggest Elite Screens, StarBright, or Silver Ticket. Previous post: Why Need Projection Screen? Next post: What is the Suitable Distance to Watch Laser TV?